Baseball cards have been around for over 100 years, but collecting trading cards as a hobby really rose to prominence during the boom of the 1980's and early 1990's. Since then, the market has changed quite a bit but there are still thousands of different types of cards to collect and seemingly thousands of different ways to store and display them. 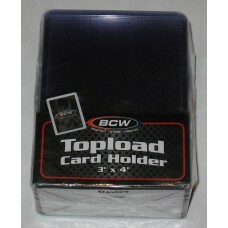 Most standard cards are the same size regardless of whether they are sport or nonsport trading cards. Some are slightly larger, while others are slightly smaller. They now come in various thicknesses, and some cards have pieces of memorabilia such has game-worn jerseys or game-used bats, balls, or other items embedded in them. 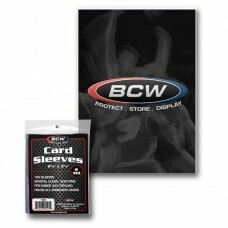 Hobbies Depot has everything you need to store, protect, and display your valuable sports or entertainment card collection. We stock poly sleeves, cardboard boxes, topload holders, snaptites, screw downs, albums, pages, corrugated boxes, stands, team set bags, and just about anything else you can imagine. We've conveniently broken up this category into several subcategories for easy browsing. Choose a subcategory below to browse items in that category.